The first Maasai I ever saw in my peripheral vision like a bright splash of the color red, and I just had to turn my head and stare, before I caught myself staring and turned away embarrassed. I didn’t want to be that wide eyed tourist, but it was hard to help myself. I was still jet lagged, and it was late - I had only come to Kenya hours before, and was still in the process of enjoying walking on solid ground after short flight in a tiny plane. I was at the edge of the Maasai Mara, on the hill overlooking a vast valley. It was hot and the colors of the landscape were a calming sepia. Suddenly, there was a movement of bright red, and a tall, slender woman appeared. She was walking slowly and deliberately up the path and after I realized it was an actual human being, not a huge exotic bird, I noticed the layers of colorful necklaces that adorned her neck, ears and head. I wondered if there was an important event going on somewhere close. The Maasai woman’s dress seemed incredibly festive and so meticulously put together that I doubted that she would just put it on like I put on a t shirt. Soon I would find out there was so much more ceremony to the Maasai everyday life than just putting on t shirts. I shyly followed the woman, who turned around and smiled at me. She entered one of the resort buildings and disappeared from view. I was staying at a luxury safari resort in Kenya at the insistence of one of my best friends. She and her fiance were getting married, and I was to be their witness, their photographer and chronicler. They were happily eloping, or have happily eloped the night before, and I decided to stay at the resort a few more days to enjoy this strange country I have never been in. It was the stuff of fairy tales to me. I am a city dweller, and I’m a bit apprehensive of nature. A safari didn’t sound like fun to me. Here, nature was big. It was vast. It was almost overwhelming. The sky seemed bigger, and the horizon seemed a lot wider than it was at home. We were perched above the Maasai Mara National Park, that stretched below us like an ocean. But I had plenty to do. I dreamily wandered from pool to bar, and now I picked a special destination: the bead room. There were eight smiling women who welcomed me to the small room that adjoined the resort gift shop. Their fingers never stopped working, and I was hypnotized at how exact their movements were. They reminded me of my grandmother, who, with small breaks for a sip of tea would construct complicated sweaters, hats and gloves. They seemed to flow from her hands, almost as if she were conjuring them up from thin air. I smiled at the memory. As I got closer, a few of the woman nodded and gestured for me to sit with them. They spoke the song like Maasai language and I wondered if I could ever learn enough to ask them what they were doing. That was a big “no”. The store keeper came right over and acted as the translator. The women worked here and made necklaces and adornments for guests of the resort. My eyes were hungrily watching a bracelet made out of hundreds of the tiniest colorful beads: white, red and blue. I saw that most of the women were adorned with beautiful red fabrics of different patterns and textures. I asked if the colors mean anything. It was the right question to ask, because it opened a flood of knowledge. 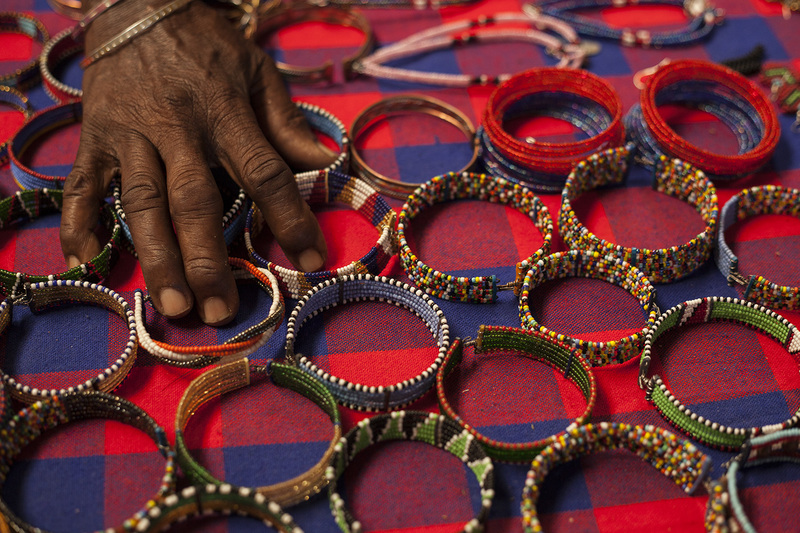 Before contact with the Europeans, the Maasai used materials found locally in order to make jewelry. Bones, clay, wood, copper or brass - those natural resources got set aside as soon as tiny glass and ceramic beads became available in the late 19th century. Different colors of beads have different meanings: red, for example, symbolizes blood. And not just any blood, but cow blood. The Maasai are herders by heritage. The blood of the cow is in their diet. It is a sacred thing, but also an everyday thing; and important enough to have it’s own symbol. He added that the color stands for strength - because the blood gives strength, and for community - because when the cow is slaughtered the community comes together. He paused. Actually, there are seven main Maasai colors: red, white, blue, orange, yellow, green and black. The red we already explained. The white is associated with purity, peace and health. White symbolism comes from the milk they drink. Blue comes from the sky - it symbolises energy. Water comes from the sky and the cattle drink the water. Orange represents hospitality. Traditionally, guests were given milk to drink in orange gourds. Orange is giving and receiving. Yellow also symbolises hospitality. The cowskins on the guest beds are yellow. Green, of course, stands for the thick grass that grows after the rain. It symbolises health of the land. Black symbolises the people and their struggles. Here, the shopkeeper struggled to put it in the right terms. It doesn’t mean that people suffer or struggle, but just that it is also a part of being human. It is one of the most sacred colors. In addition to the different colors symbolising different things, there are special types of jewelry that mean different things. Depending on what you wear it can communicate what social group you belong to - your age, social status, if you’re single, if you have kids - your achievements. I sighed. It’s like wearing your resume on your sleeve isn’t it? The shopkeeper smiles and looked down on my wedding ring. It’s aren’t those the same? I thought about it, and yes - my wedding ring signaled that I was married. In some European cultures if I wore it on my other hand it would mean that I’m a widow. My grandma told me that, and I haven’t thought about it as a cultural curiosity. In Maasai culture, when a woman gets married a special necklace collar is made for her, and it’s full of meanings. For example - since cows are so important in this culture, the bride receives cows in her dowry. The amount of cows she received is the same as the number of strands in her bridal necklace. This necklace would be made by the bride’s mother, and every part of it is symbolic. The necklace is a circle and represents the bride’s village. Maasai villages are built in a circle, with a perimeter fence. The necklace will have geometric shapes representing houses (each house will be represented), and the center of the collar represents the animal pens where the cattle, sheep and goats are kept to be safe. In a way, the bride takes her whole village with her, and her children can see their mother’s home in her jewelry. Before the wedding, the women wear a special engagement necklace - where two colors are intertwined. It symbolizes the coming union between her and her husband. It seemed so much more symbolic than an engagement ring. 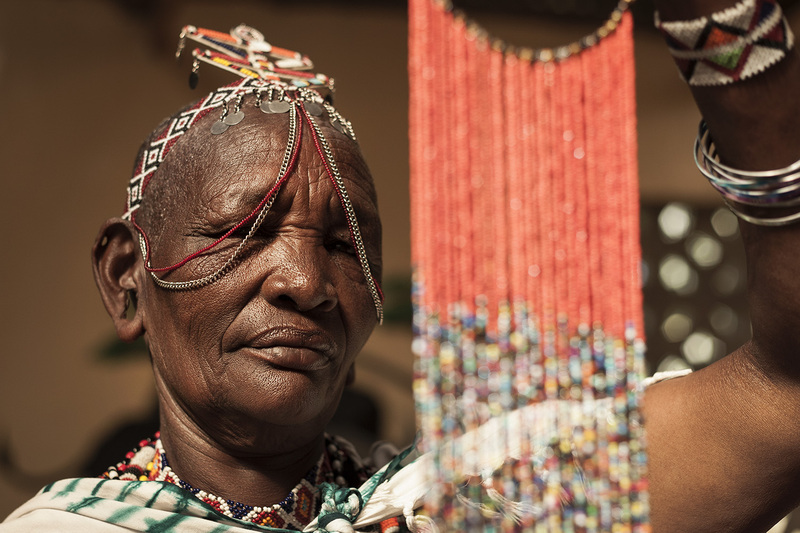 Especially since the bride would make the necklace herself - in Maasai culture only women are bead workers. There are different types of necklaces for many different occasions. Special dancing collars that are used in elaborate dances also symbolise home - and every house in the village is represented on it. Men have their elaborate beaded accessories as well, although they aren’t allowed to make them themselves. Traditional Maasai shields are beaded. They are the symbols of manhood. IT used to be that a boy had to kill a lion in order to become a man, but these days when lions are protected and the rule are a bit loosened, the shield, not a lion mane represents manhood the most. 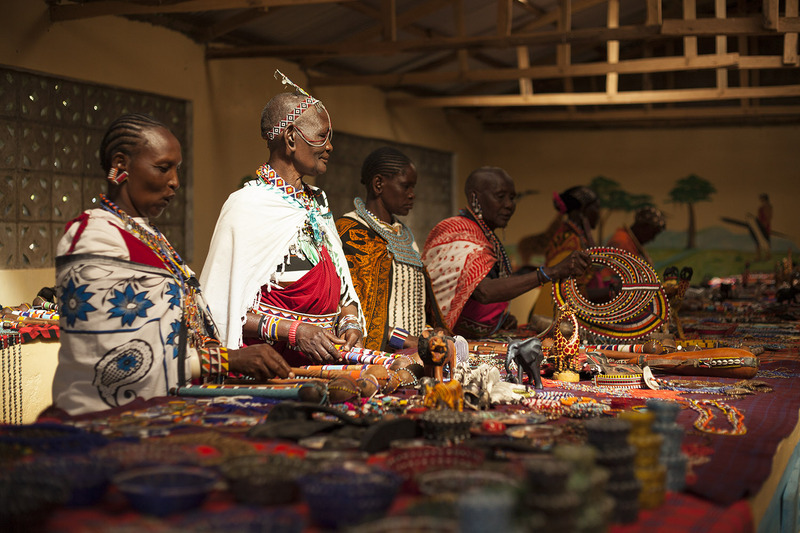 A piece of jewelry that all Maasai people wear is a pendant that corresponds to the wearer’s age. The “age class” changes every ten years. It marks a new generation. And while all the other jewelry is highly specialised and individual according to personal tastes - this one piece will be identical for everyone of that generation. I wondered at all this new knowledge in awe, and ordered a bracelet from the smiling lady I saw first the day before. She smiled and told the translator that it would not be ready in time - but that it would be sent to me. I thought about my colors and what I wanted to remember. I chose black, orange and green. Something that would make me remember the remarkable women that make these stunning pieces of jewelry. And it will never be “just jewelry” to me now. Once you go to a place like Kenya, you will always be somehow connected to this huge country that seems to envelop your every step. Oh. I did get over my fear of the natural world and went on a safari. And not just a beading safari - a real one. All the new things were a little overwhelming for my first trip - enough that I want to go back to experience it all again, just to make sure it wasn’t a dream.